I don’t know of anyone who does not like music. One of the most popular ways to enjoy your music is through a pair of headphones. But not all headphones are created equal. If your music is important to you, and you like quality sound, than Beryerdynamics could be brand you look into. And if you really appreciate a premium product that provides stellar sound, the Beyerdynamic DT 1990 Pro could be for you. The Beyerdynamic DT 1990 Pro came in a nice looking box, with photos of the headphones with it’s features and specs on the box. It looked standard so far, but that’s where standard stops. Opening the box I found a semi-hard case, that used a zipper to open and close the case. Opening the case, revealed an extremely well made pair of headphones. Surprisingly, materials used in the headphones were mostly metal, or more metal than most headphones. There was also some soft plastic, soft leather, and plush velvet earpads. Also included are a second pair of earpads, and two sets of detachable cables. The quality of materials used, as well as fit and finish, were excellent! The Bererdynamic DT 1990 Pro are a premium pair of headphones, one of their upper line. They are actually handmade in Germany, and the quality and attention to detail shows! I’m still taken back by the quality. Starting with the semi hard zippered case, you get a feel for what you are in for with the product. It had a premium feel to it. Opening up the case revealed a custom molded case to hold the different pieces. The headphones were held well securely in place. But it also had a slot that held an extra pair of soft velvet earpads. Built in at the top of the case was a soft zippered pouch. In the pouch were two sets of cables, one of which was a coiled cable. So whichever style of cable you prefer, you’re covered. Many headphones will come with a ¼” adapter so your headphones can be used with a home stereo system. Here, Beyerdynamic included not just one, but two of them. And the cables came shipped with them already screwed into each cable, secured in place. It was a nice touch. The cables were also a very premium set, being a soft plastic with a premium feel, and thick for good quality. The 3.5 mm tip is gold plated. The other end is a mini XLR cable. It is an excellent connection, with a built-in latch that holds the cable securely in place in the headphones ear cup. And you can feel it click into place. I absolutely LOVE IT! Pulling out the headphones themselves, I was extremely impressed! The Beyerdynamic DT 1990 Pro are an open back design, and looking at the earcups you can tell. The earcups are an extremely high quality metal design, that also has a type of mesh for that open design. I was extremely impressed, but it didn’t stop there. I also loved the soft velvet ear pads that also employed memory foam. The head band was a soft black leather. They can also be considered investment quality, as they are built very well, to give years of service. I couldn’t wait to actually try them out and hear how they sound. With as impressive as they looked and felt in hand, I couldn’t wait to try them out. They were very simple to adjust the headband, to get the right height for me. The ear cups also swivel, so you get a good fit around your ears. And the soft velvet ear pads are so soft! The only downside is on long listening sessions they got warm and sweaty. They’re really comfortable for those long sessions, they just got me a little sweaty is all. Now it’s time for the good part; the listening test. At first, I went to my trusty tracks that I like to go to for reviews. I soon found myself going all throughout my music collection, listening to different songs. I ended up just getting lost in the music, because they are that good sounding. I would say that to me, their overall sound signature was very natural, and neutral. They were neither overly bright nor warm. They played the music the way it was meant to be heard. The sound that they delivered was nothing short of outstanding. I have spent over 40 years around pianos. The harmonics and resolution that you can hear when you stand next to a piano being played is very hard to reproduce. Recording a piano is easy. But getting it to sound completely natural is extremely difficult! While not perfect, they were one of the best I have heard for piano. Everything else sounded excellent as well. Gershwin: Rhapsody in Blue, the clarinet sounded really crisp and woody in the reed, being able to hear excellent resolution such as the breathing technique. Piano had nice dynamics and low level harmonics with no detectable coloration. Bassoon had nice texture and clear tonguing. The soundstage was huge, and the imaging was precise. Horns were smooth and not overly brassy. Steve Miller Band: Swingtown, had crisp percussion, and vocals that were silky smooth with nice timbre. I felt like I was right next to them in the recording studio. Michael Jackson: Don’t Stop Till you Get Enough, again threw a big soundstage. This track has so many instruments and a ton of energy, and it all came through in spades. This is a very well recorded track. And when you can hear room acoustics come thru, then you know you are looking at a stellar pair of headphones. Through them you will hear details you have never heard before in your music. Metallica: Sad but True, had nice datail in the percussion and cymbals. Kick drum had nice depth and impact. To really test the bass output, I turned to my old school Techmaster PEB: Activate, and Time to Jam. Wow! The bass was clean, deep, extending below the audible limits, and played with authority that surprised me. This has been a very pleasant, yet difficult review, all at the same time. The sound quality of the Beyerdynmamic DT 1990 Pro has to be heard to be appreciated. And that was the problem for me. I kept getting lost in the music. I kept finding myself listening for enjoyment, and not subjectivity. So I had to keep reminding myself to stay on track. I guess that’s probably the best compliment that can be given. With the excellent build quality, comfort to wear, and amazing sound quality, it’s a perfect sample of synergy. At an MSRP of $599, it’s not for everyone. I think Ferris Bueller said it best. “It is so choice. If you have the means, I highly recommend picking one up.” It is choice. And it’s now my new reference model for my own personal listening. 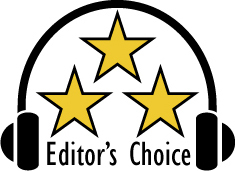 Based on its design, features, quality and performance, the Beryerdynamic DT 1990 Pro has earned our Editor’s Choice Award. For more info and complete specs, check out their website at www.beyerdynamic.com.